(AP) BEIRUT - Mortars rained down on a crowded marketplace in a Palestinian refugee camp in the Syrian capital, killing 21 people as regime forces and rebels clashed on the southern outskirts of Damascus, activists said Friday. The attack on Yarmouk camp came as the government battled rebel fighters in the nearby Damascus suburb of Tadamon on Thursday evening. Clashes there continued on Friday and sounds of explosions from the neighborhood could be heard as far as the mostly deserted Damascus downtown, with plumes of smoke seen rising into the sky. The U.N. agency running Palestinian camps confirmed that at least 20 people had died in the shelling of Yarmouk. The Britain-based Syria Observatory for Human Rights, which first reported the deaths, said the mortars hit as shoppers were buying food for the evening meal. The activists with the group would not speculate on who was firing. "We don't know where the mortars came from, whether they were from the Syrian regime or not the Syrian regime," said Rami Abdul Rahman, director of the Observatory. He added they could also have been strays from the fighting in nearby Tadamon. The state news agency blamed the bombardment on "terrorist mercenaries"  a term the government uses for rebel fighters  and said they had been chased away by security forces. The incident highlights the precarious situation of not just Palestinian refugees but all civilians in Syria who are increasingly getting caught in the crossfire of this bloody uprising that has claimed 19,000 lives since it erupted in March 2011. Every day hundreds of civilians are uprooted by the violence, according to the U.N., which estimates that 1.5 million people have been force to abandon their homes but remain in the country. 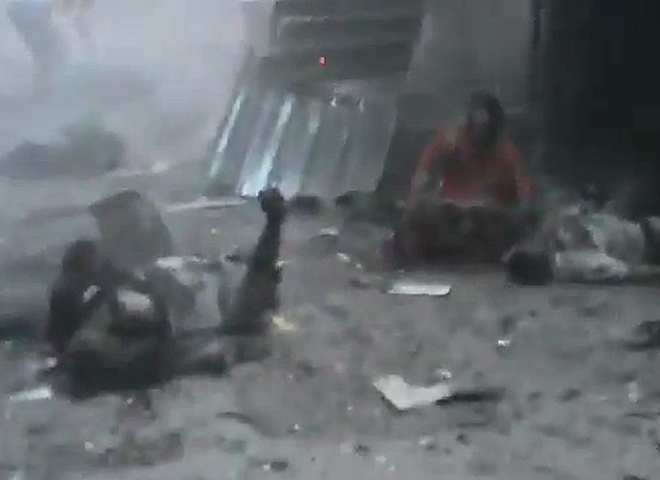 An online video of the immediate aftermath of the Yarmouk attack showed bleeding and burnt bodies with people rushing about amid the smoke and the sounds of screaming. Government troops have in the past attacked the camp, home to nearly 150,000 Palestinians and their descendants driven from their homes by the war surrounding Israel's 1948 creation. Palestinian refugees in Syria have tried to stay out of the 17-month old uprising, but with Yarmouk nestled among neighborhoods sympathetic to the rebels, its residents were eventually drawn into the fighting. Yarmouk's younger inhabitants have also been moved by the Arab Spring's calls for greater freedoms and have joined protests against President Bashar Assad's regime- and have died during demonstrations when Syrian troops fired on them. The situation of the Palestinian refugees is particularly sensitive because Syria has long cast itself as the principal champion in the Arab world of the Palestinian struggle against Israel. Palestinian President Mahmoud Abbas, whose government has a strict policy of neutrality regarding the Syrian conflict, condemned the Yarmouk attack. "The presidency demands an immediate end to all murder and destruction in the refugee camps, and protection to its inhabitants," Abbas' office said in a statement carried on the official Palestinian news agency. After the mortar attack, camp residents demonstrated against the government, chanting slogans against Assad and praising the opposition Free Syrian Army, according to online videos. The content of the videos could not be independently verified. With the civil war in Syria getting increasingly vicious, chances for a diplomatic solution to the conflict were fading after the resignation Thursday of Kofi Annan, the U.N.-Arab League envoy to Syria. Annan cited divisions within the Security Council preventing a united approach to stop the fighting. Syria's ally Iran, blamed the U.S. and its allies for Annan's resignation, saying it was their insistence on Assad's removal from power that had undermined the six point U.N. peace plan, which was never implemented. "Annan's six-point plan was accepted by Syria," said Foreign Minister Ali Akbar Salehi Friday. "It was Western countries and some regional states that didn't want Annan plan to succeed." He also accused the U.S. and its allies in the region of contributing to the instability, saying they were supplying the Syrian rebels with weapons and equipment. The U.N. General Assembly was preparing to vote Friday on a new Arab-sponsored resolution condemning Syria's use of heavy weapons to crush the uprising that has killed an estimated 19,000 people since it began on March 2011. The resolution  which like all General Assembly resolutions is unenforceable  is expected to denounce Syria for unleashing tanks, artillery, helicopters and warplanes on the people of Aleppo and Damascus, and demand that the Assad regime keep its chemical and biological weapons warehoused and under strict control. U.N. observers had confirmed Wednesday that they witnessed Syrian warplanes firing rockets and machine guns. In addition to the fighting around the southern neighborhood of Tadamon, the Observatory also reported shelling of the southwestern suburb of Jdaidat Artouz, where dozens of bodies were found after government forces swept through on Wednesday. Syria's civil war, which had spread across much of the country, only came to the capital and northeastern city of Aleppo, Syria's main commercial hub, in July. A rebel assault and revolt in Damascus two weeks ago was vigorously crushed by government forces, but pockets of resistance and sympathetic neighborhoods remain. Sporadic clashes and shelling also continue in Aleppo, especially the opposition bastion of Salaheddine as rebels and government forces hold different parts of that city. On Thursday, the rebels even deployed a captured tank against the regime and briefly shelled an air force base outside Aleppo. The U.N. peacekeeping chief Herve Ladsous warned of a major government assault on Aleppo in the coming days to retake the rebel-held neighborhoods. "The focus is now on Aleppo, where there has been a considerable build-up of military means, and where we have reason to believe that the main battle is about to start," he told reporters in New York late Thursday after briefing the Security Council on his trip to Syria.